The battle for Hill 823 turned out to be only a prelude. Gen. Peers brought up another battalion, 1/8 Infantry, and the Vietnamese added two, including their 9th Airborne Battalion, used to shield Tan Canh from the enemy’s 24th Infantry. A U.S. armored cavalry troop and a tank company secured Route 14. 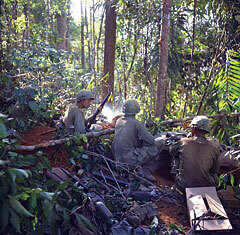 Maneuvering along the ridge above Dak To, the 3/12th Infantry encountered new defense lines every 1,500-2,000 meters. Col. Belnap’s 3/8th Infantry, laagered for the night of November 9, were hit by mortars, B-40 rockets, and fierce attacks that went on through noon the next day. The North Vietnamese hurled more than a battalion at the position. One officer believed it was one of the biggest ground attacks of the war. Americans counted 232 enemy dead on the ground the next day. Belnap moved west and had another daylong fight, this time on Hill 724. The battalion claimed a hundred enemy dead, but was heavily damaged in turn. Belnap’s strongest company was down to seventy-eight men, his other two had fifty-nine and forty-four. A smashed helicopter on the LZ burned all day, preventing medical evacuations or supply runs. The Americans were in a meat grinder. Gen. Rosson sent more reinforcements, starting with the 1/12 Cavalry of the 1st Cavalry Division, to patrol the Dak To perimeter, after which two of its companies successively reinforced the 3/8 Infantry and 2/503 Airborne. Maj. Steverton’s 2/503 air assaulted into the site of a firebase the Sky Soldiers had once used, headed toward the border, and encountered sporadic contact. On the night of November 12, Dak To received its first direct attack, a mortar barrage of forty-four rounds. Several vehicles were damaged and two men wounded. An even bigger hit took place three days later. That morning a barrage of about ten rounds hit the airfield, where several C-130s were loading elements of the ARVN 9th Airborne to return to Saigon. One plane was set on fire, wounding the battalion commander and two of his officers. Another C-130 blew up. The third plane survived, backed away by two crewmembers during a lull in the bombardment. Capt. Joseph K. Glenn and Sgt. Joseph H. Mack were awarded Silver Stars for saving the aircraft. A fourth C-130, just landing, accelerated and took off again. Late that afternoon, the barrage resumed and seventy-eight more mortars fell on Dak To. This time shells hit the ammunition dump, igniting a fire that spread from bunker to bunker. An American sergeant had almost extinguished the fire when a nearby pallet of ammo exploded, shattering his leg and cutting the hoses of Dak To’s fire truck. After that, there was nothing to be done. Steel flew through the air almost all night. Almost 1,300 tons of ammunition and 17,000 gallons of fuel were destroyed. “Jesus,” exclaimed Lt. Fred Drysen, “It looked like Charlie had gotten hold of some nuclear weapons!” Miraculously, only three Americans and three South Vietnamese were wounded in the conflagration and no one was killed. The Special Forces camp had to be rebuilt. The ARVN had their own scrape with the North Vietnamese 24th Regiment at Hill 1416, northeast of Tan Canh. The 3rd Battalion, 42nd Regiment, brought up from road security duty on Highway 14, made the contact. After that, the 2nd and 3rd ARVN Airborne Battalions moved in, replacing the 9th. The infantry blocked escape routes while the paratroopers made the assault. It was as big a melee as any of the others. American artillery and two South Vietnamese 105mm batteries laid a barrage on the hill before the ARVN, as the briefers liked to say, “worked” the position. The Vietnamese reported 66 dead and 290 wounded and claimed a body count of 248. The ammunition explosion and heavy losses confronted the U.S. command with huge obstacles. The Dak To airstrip remained unusable until November 17. Air shipments were diverted to Kontum for road haul. When flights did resume, only one plane was permitted on the ground at a time. Gen. Rosson had his supply people seek out spare ammo stocks throughout I Field Force, and the corps appealed to MACV for munitions from anywhere in South Vietnam. It became his biggest challenge of Operation MacArthur and the worst headache of his tour. Army logistics people recorded 12,700 tons of supplies received at Dak To through November, some 5,100 tons coming by air. Rebuilding of the Dak To CIDG camp began on November 26. At MACV, the deputy chief of staff for personnel, Brig. Gen. Earl Cole, was desperate to get replacements to the front. He suspended the usual routine under which GIs checked in at Saigon or Long Binh. “We called the Defense Department,” Cole said, “and got them to divert aircraft loaded with replacements from Saigon to Cam Ranh Bay”—the jet-capable airfield nearest to the battlefield. Within twenty-four hours the new men reached the 173rd Brigade’s rear base at An Khe. Other support included 2,096 air strike sorties and 151,000 rounds of artillery fire.